"Re, Kosta, I think we need a wider scoreboard." ATHENS, GREECE -- Onboard the X27 bus from the Helliniko Sports Complex back to the Ag. Demetrios Metro station, I spotted a young woman with a Greek flag draped over her shoulders. At the beginning of the evening, this flag served as a cape, confidently displaying the power of the Greek team as it came off a convincing 22 point win against Australia two nights ago. Now that same flag was being used for comfort, as her eyes were full of tears. 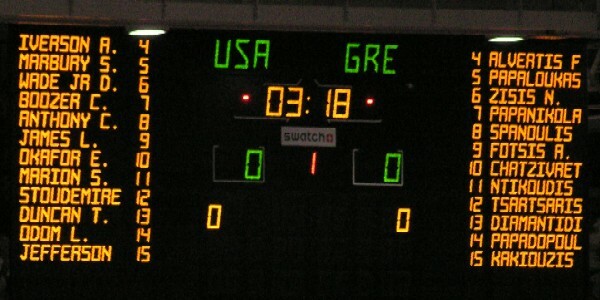 The Greek Men's Basketball Team had just lost to Team USA, 77-71. Looking around the bus, I could tell that she was not alone, as men and women could not contain their disappointment. Albeit this year's edition of the "Dream Team" is a far cry from the previous three Olympic editions that dominated play, the fact remains that the US was still a co-favorite coming into this tournament, and a Greek win against any team with USA splashed across the front of its jerseys would have been monumental, despite the fact that the US embarrassed itself two days earlier by losing to Puerto Rico by 19 points. It may have been that double-digit loss two days earlier that was the difference in the game. Team USA came out with a sense of purpose and hustle that it lacked against Puerto Rico and it showed in a huge differentials in offensive rebounding (16-4), fast-break points (17-7), and second-chance points (14-2) over the Greek team. 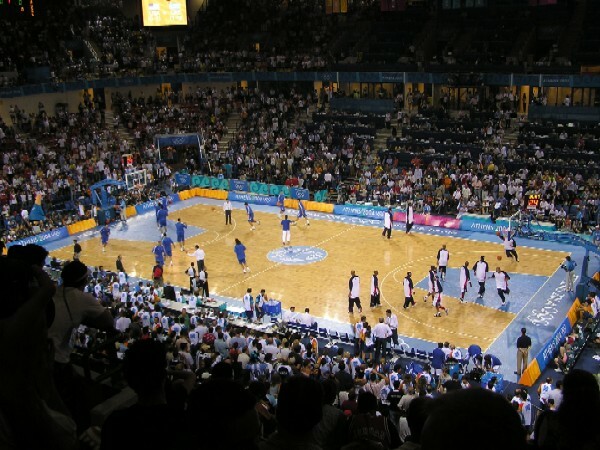 A view from the upper level of the Helliniko Indoor Arena. A few minutes before tip-off I was still deciding which team I was going to root for, but the moment both teams ran out onto the court for warm-ups, that decision became an easy one. It seemed that everyone in the arena save a couple of hundred people were vociferously rooting for the Greek team, regardless of whether or not they were Greek or not. (I don't know how much of the crowd noise could be heard on NBC's telecast, but at times it was truly deafening -- those 12,000 fans were as loud as 80,000-100,000 fans cheering in domed and open-air stadiums I've been to in my college days following UVA sports.) Fans from Spain and Argentina, teams which played a thrilling game to start the night's two-game session, joined in on the pro-Greek chants; while the Greek language is not universal, clapping in rhythm and whistling (i.e. the non-American form of booing) every time Iverson touches the ball is. For the first time ever in my lifetime of watching US basketball, given the environment in which they were playing, Team USA seemed like underdogs. Couple this with the reality that a loss to the Greek team would have been a disastrous blow to Team USA's medal hopes, I rooted for Team USA to win, but in a close victory as to not demoralize the Greek team in future preliminaries later in the week. "Here, Lebron, I got you a little Greek flag." 2. Why do Greek fans get louder when a Greek player is on the free-throw line? Go to the most raucous of basketball arenas in the U.S., especially in the college game, and when one of your own is on the line, you can hear a pin drop. 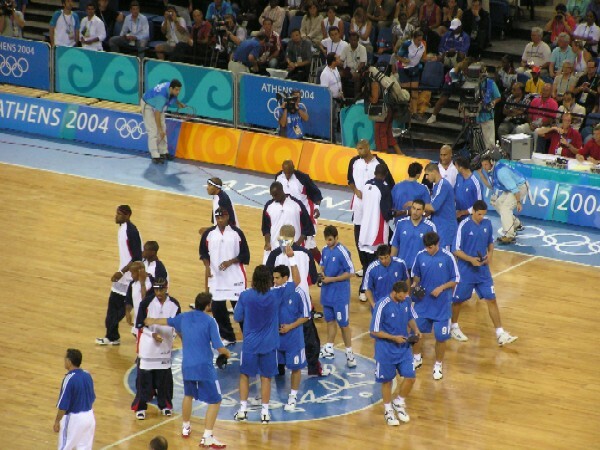 Although I was rooting for the US team, every missed Greek free-throw, especially those that were missed long, irked me, as I doubt the Greek team practices free-throws with simulated pro-Greek chants pumping through their practice facility's P.A. system. 3. Is basketball the only sport where you're not allowed to take plastic bottles in the arena? I don’t remember having this restriction at the Greece vs. Italy softball game I went to yesterday. Now that I think about it, if one could hit a player with a plastic bottle from where I saw sitting inside the Helliniko Indoor Arena, then maybe they’re the homegrown talent the Greek softball and baseball teams should look to for its future editions.